I usually associate dried egg noodles with hearty meat stews, like goulash or Stroganoff, and mostly in a side-dish context. Of course, this is odd, because when I make fresh pasta, I always make egg noodles, and they are always destined for the center of the plate. After sampling the pastas from Cipriani—the real Cipriani, from the legendary Harry’s Bar in Venice—however, I may never make fresh fettuccine again. 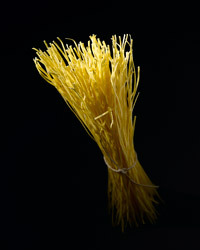 The noodles are so light and elegant, so silky and slippery-soft but still truly al dente when cooked right. Apparently, they get that texture from being passed through the rollers 100 times and then dried slowly over a period of 17 hours. What’s truly amazing is that the pasta is fantastic in delicate preparations that feature fish, lobster, oysters, uni, eggs and vegetables, but it can stand up to a hearty lamb or veal ragù just as well. Be sure to look for the pasta in the rectangular box, as there is another brand that goes by almost the same name.